Sasak craftsmen in Lombok have been producing pottery for centuries. Passed from one generation to the next, this tradition is mainly preserved by women, and this activity often represents their only source of income. 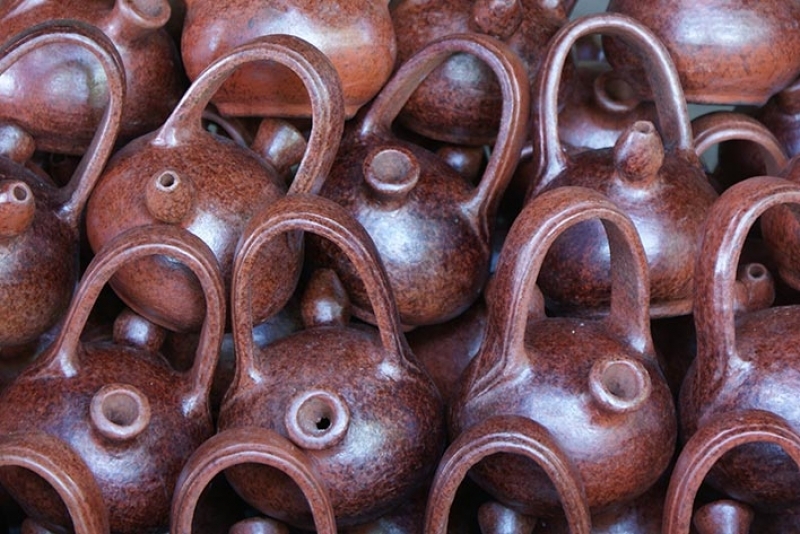 Traditional Sasak pottery, locally known as “turun temurun", is made using one of the oldest known techniques to make pottery and Lombok is one of the few places on Earth where this technique is still being used. Artisans source the clay locally; they then press it and shape it by adding layers of clay with their hands or simple tools such as stones and wooden paddles. The object is then smoothed and refined with a coconut husk and fired using the traditional method of burying the pot in the ground surrounded by burning coconut husks. Many villages in Lombok produce pottery and patterns and designs are unique to the village where the object was crafted. Traditional pots and decorative items can be purchased in all main tourist areas; however, Banyumulek village in West Lombok is one of the main pottery centres on the island and one of the best places to observe the traditional making process and where to find the widest range of items; prices range according to the size, style and motif of the object. By purchasing Sasak pottery, you will be contributing to the perpetuation of this tradition and you will support a sustainable livelihood to local women and their families.